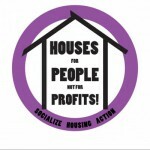 Housing for people, not for profit! We are confronted with a brutal European austerity regime which continues to transform our livelihoods into financial assets for global speculation, which violates the universal right to housing every day, which destroys democracy at all levels and has no socially acceptable solution for the crisis of capitalism. Not only since the crisis it is the poor and excluded who get hit by this system especially hard: un- and underemployed, homeless, precarious workers, immigrants, Roma, students, single mums, and everybody who is not willing to fit into a capitalist mode of reproduction. This group is now becoming the majority of society. How the capitalist systems plays out in the diverse housing markets in Europe might be different, but the underlying logic of neoliberal politics, privatization and financialization of our homes is the same. This is why we aim to stand up, to unite our struggles and to broaden our movements. We will not let us be divided by neoliberal politics. Join our struggle on October 19th!